Itchiness, flaking skin, dandruff, sores and irritation. These are just a few hair-pulling frustrations that even the most veteran beard enthusiasts can experience at some point. However, there are just a few vital accessories that you can incorporate into your grooming regimen that will literally change your life. Although the above may sound like an exaggeration, many men tend to give up on their beard due to the suffering they endure. Shaving away all their scruff, their beard perishes prematurely and they’re often filled with regret afterwards. 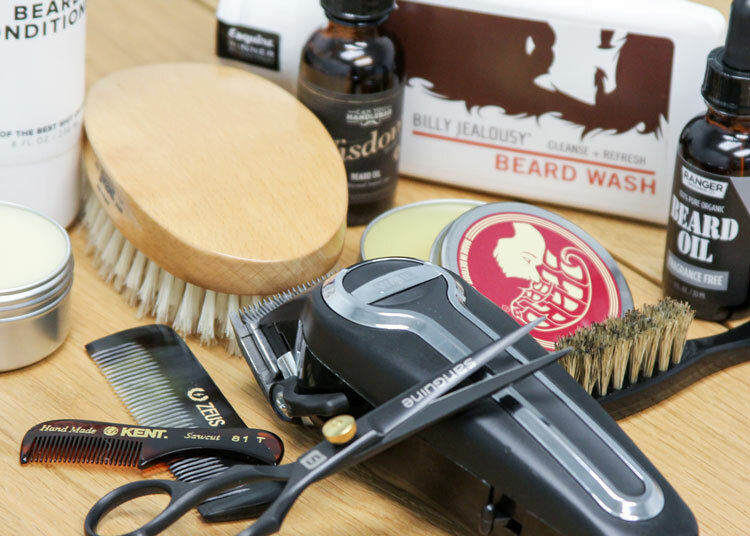 By following our series of beard care guides and stocking up on the right accessories, you will never have to live through that again. Instead, you will have a tamed, healthy beard with a magnificent shine and blossoming volume. Sounds good? Then read on! What Accessories Do I Need For A Healthy Beard? Oils: What Do They Do & Will It Increase Growth? Balms: What Is Beard Balm & Why Do You Need It? Shampoo & Conditioner: Should You Shampoo Your Beard? Simply click one of the above to head straight to that guide and “brush” up on what you need to know! Otherwise, scroll down to learn why beard care is absolutely vital! Why Do I Have Beard Dandruff? How Do I Straighten My Curly Beard? How Do I Make My Beard Soft? It’s likely that you’ve experienced one of the inconveniences above. Simply click on the subject that concerns you the most to jump straight to it. Otherwise, scroll on down to learn more about each one. However, maybe you haven’t yet put a finger on the reason why you’re going through living hell? If you’re thinking about just shaving that beard off, hear us out and maybe you’ll change your mind. 1. Why Does My Beard Itch? An itchy beard is an excruciating experience. However, rest assured that you are far from alone! Beard itchiness can occur very early on for a number of reasons. As we explain in Bespoke Unit’s beard homepage, the “root” cause comes from your last shave. Firstly, shaving cuts hair follicles from an angle. Therefore, hair grows back as sharpened points. You won’t feel anything at first but your loved-ones will. With just a kiss on the cheek, they may remark how your stubble stings. As the stubble transitions into a beard, gravity begins to work and the hair growth falls and curls in on itself. Your beard literally turns against you! It’ll chafe, it’ll prod and it will scratch. However, to make matters worse, it’s not the only issue that you’re facing and the above literally rubs salt into your wounds. In every guide, we’ll talk about the importance of sebum, a natural oil produced by hair roots to nourish the follicles. It’s the natural ingredient that makes hair shine and creates volume. When it builds up too much, it can even make your hair oily. Therefore, we need to shampoo regularly, right? Actually, beard hair is thicker and the skin underneath is far more sensitive. Therefore, it needs a healthy dose of sebum to survive. However, shampoo works by stripping hair of oils and trapping them in the pores. Consequently, over-washing causes dryness, which leads to irritation and even open sores! This paired with needle-like hairs rubbing into your skin is a recipe for insanity. The solution? Firstly, wash your beard less but wash it properly. You’ll also need to properly hydrate your beard and skin underneath to keep it nourished and healthy. To learn how to properly wash your beard, head to our detailed beard shampoo and conditioner guide. In addition, discover natural beard oils as well as beard balms with their dedicated guides. 2. I Want To Get Rid Of Beard Dandruff! Similarly, another symptom of dehydrated beards is flaking skin. Often referred to as “beardruff”, beard dandruff is an utter nightmare and can strike at any length. As your beard grows, the pores may struggle to provide the follicles with sufficient sebum. After all, its production remains constant whilst the length of your hair increases. Therefore, it needs a good few days before being able to naturally distribute enough sebum all over your beard and leave enough on the skin to keep it hydrated. However, the problem is that you’ll likely need to wash before then. Simply shampooing your beard may get rid of the existing dandruff intertwined in your growth but it will make it worse. So what can you do as a sustainable long-term solution? Firstly, always use conditioner when you wash your beard. As described above, beard shampoo strip away sebum. However, conditioner works by replenishing the hair and skin with other oils that take its place. Nevertheless, that won’t be enough to stop your dandruff. You’ll need other accessories to ensure that your beard is dandruff-free. Firstly, you will need something to hydrate after your shower. Beard oils are great for providing instant relief as they are full of oils that emulate the positive effects of sebum. In addition, they often feature essential oils that soothe irritated skin and heal acne. Finally to ensure that the oils are properly distributed into your beard and that they have penetrated deep into your skin, get a beard brush. Boar bristled beard brushes work best with facial hair as they are soft enough to soothe the skin yet rigid for deep penetration. Furthermore, boar bristles have a natural membrane, which absorbs oil from moist areas but releases it in dry patches. They’ll also lightly exfoliate the skin and sweep away any remaining skin particles and dirt that are hiding out in your beard. Our dedicated beard shampoo and conditioner guide will cover all your washing needs. We also have an excellent beard brush overview and buying guide as well as an introduction to beard oils. 3. How Do I Straighten My Curly Beard? Some men may suffer from overly curly beard growth. While this isn’t strictly an ailment, it’s certainly a frustration. You’ve been working hard and pushing your patience to the limit to get your beard to a decent length. However, it bunches up and curls all over the place and you don’t even notice all that handsome length! While there are solutions with varying degrees of intensity, filching your lady friend’s straighteners may not even be necessary. Avoid being scalded by the iron and scolded by your girlfriend and consider trying out a few simple remedies beforehand. In order to straighten curly beards, you’ll need more than just a beard brush and oil. In fact, beard brushes are great for taming unruly beards but they just don’t quite cut it when confronted with full-blown curls. Therefore, you’ll need to seriously consider investing in a beard comb, which will get in deep enough to unravel those locks. In addition, a solid beeswax-based beard balm with give it some hold and ensure that it doesn’t become frizzy during the day. The best time to do this is right after a hot shower with only towel-dried hair. Keep your beard slightly damp for extra control. You’ll want to comb your beard once without anything in it to remove any tangles then once again after applying the beard balm. Regularly following this routine can even train your beard to stay straight over time. For a finishing touch, consider blow-drying the hair before applying the balm if you have very curly hair. Comb it while it dries to really straighten your growth and then carefully apply the balm to make sure it doesn’t frizz. However, if you don’t have a blow-dryer, you may have to appeal to said girlfriend’s kindness and ask to borrow hers at least to see if it works for you. You can read all about beard combs with our detailed beard comb guide, which also covers how to use them. Make sure to also read up on beard balms to learn how they differ from beard oil. 4. My Beard Is Scruffy & Frizzy! How Do I Make My Beard Soft? An infernal reality of natural beard growth is confronting unruly and messy growth. As the hair grows out, it will become an unmanageable, tangled mess that feels coarse and rough to the touch. You’ll hate having it on your face and your partner may even resent it. Leaning in for a kiss becomes a gruelling experience and can be likened to embracing a wild badger. But that’s nature and beards are supposed to be like this, right? If we were all running around in animal pelts and banging rocks together to make fire, then sure, it would an unfortunate reality. Better sharpen those flints then and scrape it all off before you club a mate! However, men have been using various natural remedies to soften and treat their beards since Ancient Egypt and even in Mesopotamian Civilisation. After a brief stint with synthetic beard care products, discerning beard enthusiasts soon came running back to updated variations of these very treatments. Most synthetic treatments for any hair contain a number of toxic chemicals that can actually harm your beard. This especially includes shampoo. From paraben to Sodium Lauryl Sulfate (SLS), there are countless of additives that can cause an array of issues such as infertility and cancer. The best and most effective beard oils or balms contain only 100% natural ingredients. Many ecologically-conscious manufacturers have even turned to fair trade and organic solutions for a truly pure beard-softening experience. In short, beard oils and balms don’t only hydrate your beard and skin but soften it and tame unruly stray hairs. Packed full of natural carrier oils, they create a healthy shine and encourage growth. Certain ingredients can include other benefits such as boosting volume. Generally, beards become dull, frizzy and unruly when dehydrated. The follicles dry out and can even become brittle, which causes them to tangle and form knots. On the other hand, properly moisturised beards are soft, shiny and voluminous. In addition, regularly oiled beards are far more manageable and frequent brushing will ensure that the hairs stay in place and stack beautifully. Our guide on beard oils features a detailed explanation of all the benefits that they provide. Similarly, you can read up on the natural properties in beard balm and how they can make yours more healthy. 5. Why Is My Beard Patchy? Unfortunately, some men may face certain natural barriers when growing out their beard. A common cause of crushing disappointment is discovering that you have been cursed with patchy beard growth. This may be experienced through glaring holes in your beard or just sparse growth. Whilst there is no magical solution to turning a bare face into a bush of fuzz, there are a few things you can try to try and fill out sporadic patchiness. Firstly, as explored in greater detail on the beard homepage, hair growth takes place in cycles. These consist of the anagen, the 7-year growing period, the catagen, a latent phase, and telogen when the hair sheds. Of course, these aren’t synchronised otherwise men would be shedding their entire beards overnight. Instead, all follicles are experiencing different phases. Therefore, the first thing to do is grit your teeth and bare with it while your beard grows out. If it’s particularly patchy, trim regularly to ensure both young and old beard hairs grow out the same length. After around a few months, you will have achieved your growth surface potential, which means that you’ll unlikely develop any new hairs. 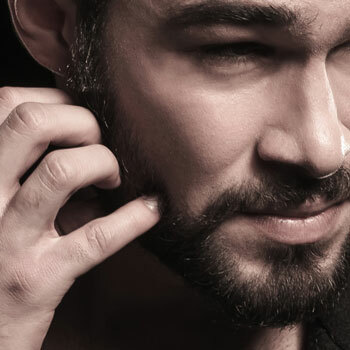 If your patience has managed to endure this long but it’s still far too patchy, you can always consider a number of different partial beard styles, which we cover individually in detail. In the meantime, you can use a mix of several natural products to encourage new hair growth and fill patchiness. A combination of quality beard shampoo, oils and a brush will stimulate the roots and follicles and may result in a little extra growth. Finally, you may soon want to trim your beard one way or another. If you just have a few stray hairs that you want to touch up, you can learn all about beard scissors. However, if you’re looking to really shorten its length, check out our full beard trimmers how-to and buying guide. Now that you have read all about the common beard ailments men may face, read more by exploring any of the particular aforementioned guides in detail. Alternatively, you still may be new to the beard game and maybe would like to see what beard styles are compatible with your face shape! Does this apply to all races (native African)? Yes, absolutely! Although everyone’s skin is slightly different, the same fundamentals apply no matter your age or race. In fact, I’d even say it’s more important for men with African ancestry as they often have coarse or curly hair. Darker skin tends to react to inflammation, such as that caused by razor bumps and ingrown hairs. So you may even see better results by following a beard grooming regimen. Let us know whether you have anymore questions and we’d be happy to help. Glad to be of help! If you ever have any questions on beard care, feel free to leave us a comment and we’ll be sure to answer to the best of our abilities. Hello, I am interested in buying your kit and I am over the moon that the products are not tested on animals. Are the products vegan and what material is the bag made of? We don’t sell kits but review different products and recommend the best ones that we test. What products are you particularly interested in and I can check what is vegan and/or not test on animals? I came across this product and hope you can tell me of it is vegan. Je me permets de vous répondre en français vu que le lien que vous m’avez partagé vient de Groupon France. J’espère que je ne me trompe pas ! Je vois qu’il s’agit au moins de produits sans colorant ni paraben non-testés sur les animaux donc c’est déjà ça !